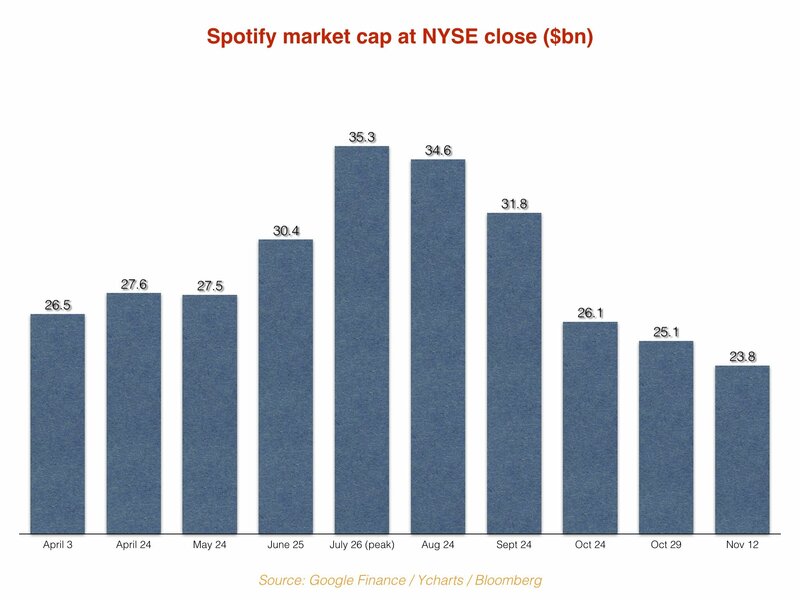 Spotify is worth less than $24bn in market cap terms for the first time since it floated on the New York Stock Exchange in April. The company today (November 12) finished trading with a $131.31 share price, down 4.89% on Friday’s price at the NYSE bell. That, according to Bloomberg data, equates to a current market cap value of $23.79bn. As MBW has previously demonstrated, SPOT’s share price high-point came in late July, when its stock hit $196.28 – giving it a market cap of $35.3bn. The firm’s market cap today, then, represents a fall of more than $11.5bn – or 33% – on this peak performance. At least part of the blame for this decline has to be pointed at macro influences hitting tech stocks in the US market (which is why Tencent Music delayed its planned floatation in the States last month). But Spotify’s Q3 results, announced November 1, also brought cause for concern for some SPOT analysts. Spotify announced in the quarterly earnings that it was slightly revising down the top end of its guidance for year-end Monthly Active Users (199m-206m) and paying subscribers (93m-96m). Since then, SPOT has seen its target share price lowered at the likes of JPMorgan, Wells Fargo and Barclays – although brokerages typically still seem positive on the stock, with consensus amongst 32 companies covering Daniel Ek’s firm stating that it’s a ‘Buy’.